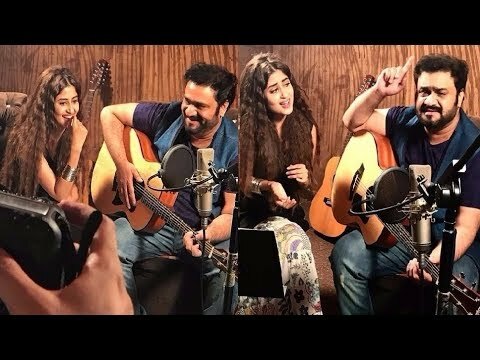 Sajal Aly’s debut song will leave you mesmerised! The girl has got some serious talent, there’s no denying that. Her acting is beyond par but recently we came to know that she is made of many talents and that acting is just one of those. Sajal Aly is making headlines again these days with her new dramas, O Rangreza and Yaqeen Ka Safar, which have literally taken over national TV. The Instagram fraternity was left intrigued by a picture the star posted a few weeks back. There she was with the inimitable Sahir Ali Bagga. There had to be music involved. And the caption that said “Guess” was enough to keep us on our toes. Well, she is now out with her secret and what a well-kept secret it was! The acoustic version she’s sung for her TV show O Rangreza, which also features rising star Bilal Abbas Khan, is just beautiful. You need to hear to understand what we are talking about! The Gul-e-Rana star has actually surprised us with her beautiful vocals and here’s hoping that she will explore this further. Her recent Bollywood debut Mom, alongside Adnan Siddiqui, Sridevi, Akshaye Khanna and Nawazuddin Siddiqui received massive appreciation from the audience and critics alike and looks like there is no stopping our favourite starlet. Here’s wishing her an amazing future!